So I import the photos, then, while still in Previous Import, I make my selections, picks, rejects… The problem is that Lightroom behaves differently in Collections vs. All Photographs. Pressing the Delete key in All Photographs will ask you if you want to delete the photo from the catalog or delete the Master photo from the drive. Pressing the Delete key in a Collection will simply delete the photo from that collection. No question or confirmation asked or required. 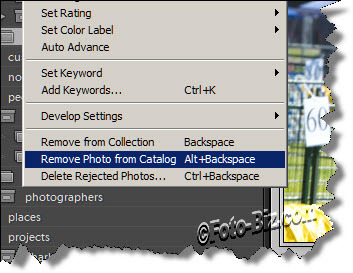 Pressing the Alt-Backspace will delete the photo from the catalog, but it will not delete the photo from the drive. Pressing Ctrl-Alt-Shift-Delete or Cmd-Alt-Shift-Delete will delete the photo from the drive while still in the collection. Switching from the Collection to All Photographs will still highlight the current photo. And pressing the Delete key will give back the standard delete message to remove the Master photo from the drive.